Athletics play a vital role in a Geneva College education. Equipping students for lives of faithful and fruitful service to God and neighbor involves training, preparation and competition in the intensity of intercollegiate athletics. Sports contribute to campus culture and school spirit as students learn to embody Geneva’s mission and values, representing the college in competition and supporting one another as teammates and fans. We maintain high expectations for Golden Tornadoes athletics. We expect our student-athletes to develop selfcontrol in heart, mind, soul and strength—an intense and vital quality of Christian leadership. We expect our teams to improve in their preparation and competitive performance on a day-to-day and contest-to-contest basis. Finally, we expect our student-athletes to exhibit relentless heart in the crucible of athletic competition. Built in 1925, Reeves Field displays Geneva’s commitment to athletic excellence. Reeves remains the premier outdoor stadium within the Presidents’ Athletics Conference and is one of the finest outdoor performance facilities among NCAA Division III institutions. Thousands of athletes and fans enjoy the stadium and facilities each year; Geneva placed in the top ten for NCAA Division III football attendance this past season with nearly 4,500 spectators per game. Reeves Field has earned a reputation as one of the finest playing facilities not only in the Presidents’ Athletic Conference but nationally in NCAA Division III. Playing host to both football and soccer intercollegiate contests, Reeves Field is more than just a game-day facility. It is a centerpiece of activities for nearly every Geneva College student. 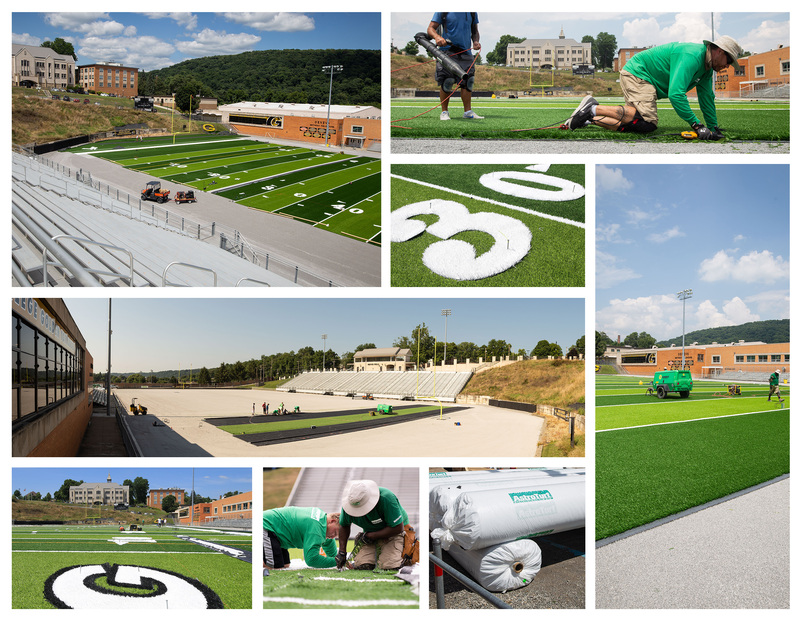 Initially installed in 2007, the time has come for the turf to be replaced with a new state-of-the-art surface that will be safer and more cost-effective for our current and future students. TURF QUALITY: The new turf available today is of higher quality and boasts a longer life expectancy. BEAVER FALLS AND THE COMMUNITY: The Beaver Falls High School football team has called Reeves Field home for generations. The 2016 WPIAL and PIAA champion Fighting Tigers continue to bring a great sense of pride to the entire Beaver Falls community. GENEVA COLLEGE STUDENTS: From intramural opportunities to the rugby club, marching band and many other activities, students will benefit from the new Reeves Field surface for many years to come. PLAYER SAFETY: New technology developed by the turf industry will help reduce player injuries, especially those related to concussions. EXPANDED SPACE: The expanded square footage of the playing surface will help accommodate the largest roster size in Geneva football history. 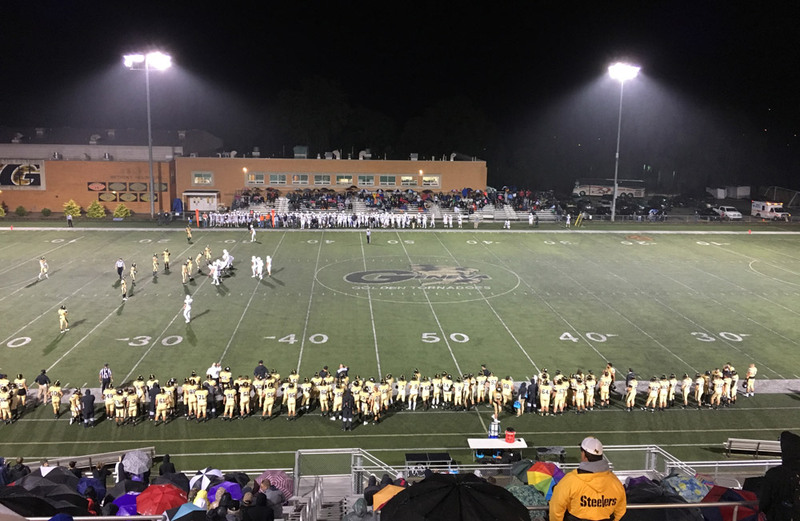 RECRUITING: An upgraded playing surface ensures continued hosting and recruiting opportunities like the Penn-Ohio High School All-Star Game, WPIAL and PIAA play-offs, and a national football camp that attracts student-athletes from 15 states. STYLE OF PLAY: Geneva’s men and women pride themselves on being possession-oriented teams. The additional width will allow for more tactical breakdowns of opponents and generate more goal-scoring opportunities in the attacking third. NCAA PLAY-OFFS: Enhancing Reeves Field to meet the NCAA field dimension requirements gives Geneva College the opportunity to host NCAA Division III national tournament matches. A regulation field will also be attractive for high school play-offs, all-star games, club soccer matches and community soccer events. SOCCER CAMP: Geneva College Soccer Camp is the fastest growing soccer camp in Western Pennsylvania. Each summer camp attendance has grown exponentially. Geneva hosts close to 200 youth soccer players each June and the number continues to rise. A new surface and expanded area will enable Geneva to seek continual growth for camps each year. BETTER CONDITIONS: Performances and practices are not cancelled because of rain or a muddy field. SAVINGS: With no mud on the field, band uniforms need to be cleaned less often, extending the life of the uniforms and saving on dry cleaning costs. PRIDE: The attractive field provides a venue that fosters pride in students. High schools also use Reeves Field for a marching band festival each fall. This event promotes the Geneva College marching band, assists in recruiting future band students for Geneva College and serves the local community. Significant improvements are planned for the south campus athletic complex from Reeves Field to the south end of campus near the Eastvale Bridge. The chain-link fence from the Armstrong Cork Works will be removed. A Reeves style and quality fence will be extended along the softball and soccer fields, adjacent to Route 18. The sidewalk will be widened and lighting enhanced from Reeves Field to the south end of campus. Geneva College will provide set-aside property to present a more gracious corner, replacing a narrow, sharp corner as Route 18 turns toward the downtown and the Eastvale Bridge. Among the benefits to the Geneva community and residents of Beaver Falls is a space that will visually invite walkers and bikers to come here, improving the enjoyment and safety on campus. A revitalized south campus will demonstrate Geneva’s commitments to core values like hospitality to recruits, prospective students, parents, community members and visitors who come to campus. The total cost for replacing the Reeves Field turf and expanding the size to allow regulation playoff soccer games is $850,000. The Geneva College Board of Trustees approved fundraising for this project in their April 2017 meetings. The enthusiasm already expressed for the Reeves Field enhancement project points to its importance to the recruiting and training of future student-athletes, as well as to the campus as a whole. With your participation, we can reach this goal by March 31, 2018. Commitments can be fulfilled thorough May 31, 2019 – all at one time or through installments that best suit your situation. Reeves Field when the turf was installed in 2007. Reeves Field now, at the start of the 2017-2018 athletic season. As we move forward with this exciting project, we are seeking financial and prayer support from interested individuals and businesses. Thank you for your interest in what God is accomplishing through Geneva College. We are grateful for your partnership. This table shows the various gift amounts needed to complete the Reeves 2.0 project. 1. PRAY that we will continue to make an impact for eternity in the lives of our students. 2. GIVE a generous gift to the Expanding our Edge: Reeves 2.0 project. 3. ENCOURAGE your friends and associates to support this worthy effort through their prayers and gifts. Based upon your understanding and appreciation of Geneva College, please prayerfully consider giving a generous gift to this project during the next 18 months that is over and above your normal annual giving. 1. QUESTION: Wasn’t the turf just installed on Reeves field? The current turf field was installed in 2007, with a lifespan of 10 years. The company that installed the turf is doing maintenance work to extend the life of the product one year; therefore, we are getting 11 years of use out of the turf. 2. QUESTION: What is the fundraising timeframe for Reeves 2.0? We anticipate concluding the fundraising for this project by March 31, 2018. Commitments can be paid through May 2019. 3. QUESTION: When will the new turf be installed? The installation will take place in spring 2018 so that it can be ready to use for the August 2018 football camp. 4. QUESTION: Why expand the size of the turf for soccer? Geneva’s soccer team placed first in the President’s Athletic Conference in 2016. Our current soccer fields do not meet the width requirement to host a NCAA National post-season playoff game, which is something we want to do in the future. The width of Reeves is 67 yards, and it needs to be 70 yards wide. Widening the turf field for soccer is the most efficient use of space and resources. Athletes expect to play on turf in college. More colleges, and even high schools, have moved to playing on turf fields. Only two colleges in the PAC league don’t have turf while just two others in the PAC do not have a regulation size soccer field. 5. QUESTION: Why didn’t we build a regulation size NCAA soccer field from the start? We were transitioning from NAIA to Division III. The grass field met league requirements as field variances are permitted in regular season play. With limited resources, and most soccer teams still playing on grass, the Reeves turf was initially designed primarily for football. 6. QUESTION: How will an expanded field help Geneva’s football team? Geneva’s football roster continues to expand, and every square foot of field space is needed to facilitate practice for a larger football roster. 7. QUESTION: Has the new turf product improved so that the life span is longer? Yes, the new product should last longer than 10 years. 8. QUESTION: Will the College use my gift to Reeves 2.0 for other purposes? No. Giving to Reeves 2.0 is a designated gift. Designated gifts are legally restricted and can only be used for the purpose they are given. 9. QUESTION: Why didn’t Geneva set aside funds each year to replace the turf? Budget challenges of the past number of years have procluded large-scale preventative maintenance on campus.